Garden pebble moth and crucifer caterpillar. Green caterpillars with a row of black spots along each side and a white head, found around the leaves and heads of Brussels sprouts plants. You may also notice black frass (excrement) on the leaves. Holes will appear in the sprouts and leaves will be eaten and webbed together. The adult moths are light brown in colour with a wingspan of 25 to 31mm and, when resting, they hold their wings in a distinctive tent-like pose. As part of the endopterygota group of insects, caterpillars have a complete lifecycle. Eggs are laid by the adult moths which hatch into the larval instar, which is the caterpillar stage. The caterpillars feed (this is when the damage occurs) and then pupate, before metamorphisising into the adult form (the moth). There are two generations each year. The caterpillars tunnel into the developing sprouts, ruining the harvest. They also damages the leaves. The most serious damage is done in late April to June and late July to September. Mainly found on Brussels sprouts, but can sometimes attack other brassicas, particularly young plants, and occasionally other plants. One of the simplest ways to prevent a caterpillar infestation is to put up barriers (such as fine netting) to prevent the adult moths laying eggs on or around your plant (this is particularly useful in vegetable patches or cut flower production areas). Good hygiene, particularly removing debris over the winter, can remove overwintering sites for eggs, caterpillars and pupae. Regular inspections of susceptible plants will enable you to pick off and dispose of any caterpillars or eggs on the plant. This method may seem a bit basic, but it works more quickly and effectively than insecticides. Encouraging natural predators into your garden, such as birds and predaceous insects can help to control the population, although they may bring different pest problems into your garden. 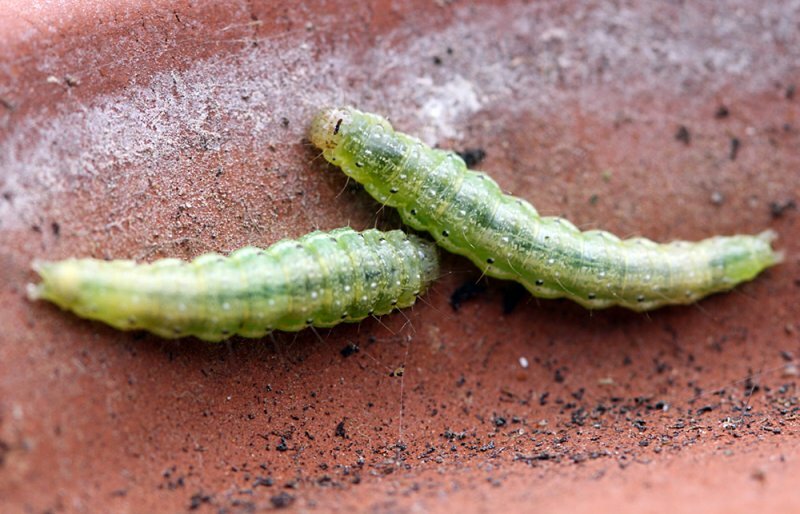 Contact insecticides are available to kill caterpillars, although you must be careful to get the right chemical for the type of caterpillar you have and the type of plant being attacked. Some systemic insecticides also treat caterpillars (if they have some residual contact action), although they are less effective on caterpillars than other pests such as aphids. 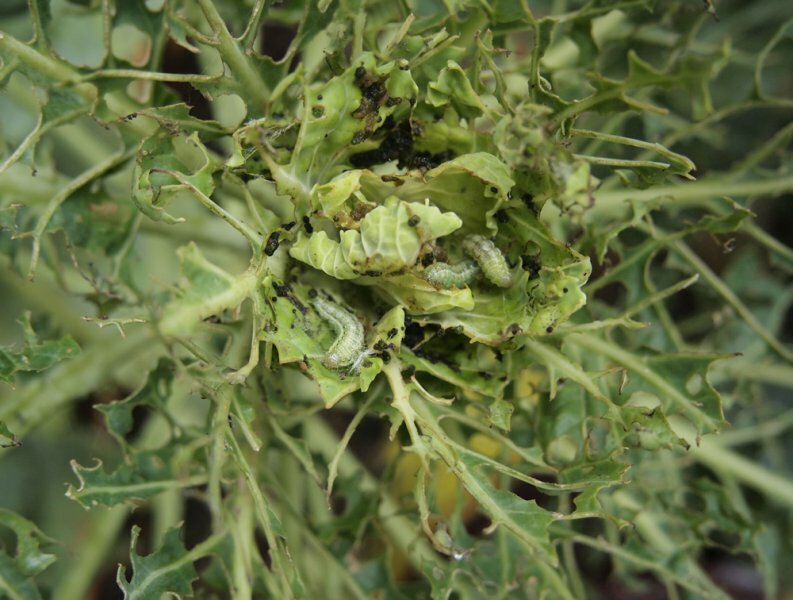 A biological control, Bacillus thuringiensis, is available for leaf-feeding caterpillars, particularly those attacking brassicas. The common name ‘crucifer caterpillar’ relates to the larva’s diet of brassica plants, which are also called cruciferous plants.